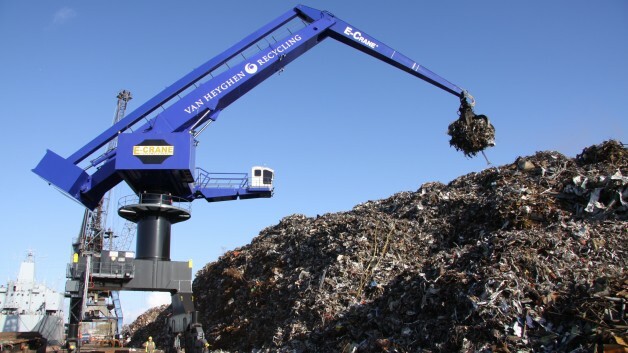 This is the third successful installation of an E-Crane® for Van Heyghen Recycling, part of the group Galloo. There are now seven E-Crane® balanced cranes operational at the different Galloo sites in Belgium and France. The new 2000 Series E-Crane® has greatly reduced operating time and costs in loading Handymax vessels and in receiving, handling and stocking scrap in the yard. The E-Crane® is used for stockpiling the scrap to a height of over 25 meters, necessary to ensure there is enough scrap ready for the loading of Handymax ships. Since the arrival of the new E-Crane®, unloading barges with scrap for this stockpile takes less than half the time it did before! When loading smaller coasters, the measured loading rate surpasses 1.000 TPH and with the help of this 2000 Series E-Crane®, the ocean going Handymax ships can now be loaded in under 48 hours.